First, this is geared more towards younger kids, so if your child is older some tweaking may be necessary. For those of us who aren’t quite kids, but still kids at heart — well — you should really be able to throw your own party. Second, don’t worry or stress out if everything doesn’t come out perfect. The party is for the kids, not the adults, and the real point here is to have fun. Right? One of the most important parts of any party are the decorations. 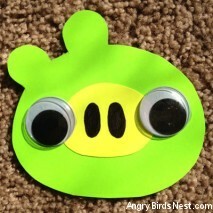 For an Angry Birds party if you stick with primary colors there is almost no way to go wrong. Up until a few short months ago there were not many officially licensed Angry Birds party supplies (at least not that we could find), so you really had no choice in the matter. Today you can now find branded party supplies at sites like DiscountPartySupplies.com. 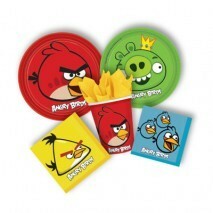 They have plates, napkins, cups, and more, all decked out with Angry Birds and Pigs. 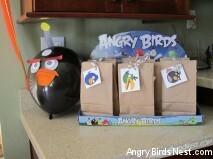 There are even Angry Birds centerpieces, balloons, star-shaped weights (to hold the balloons down), and cups. After the main decorations were up we went to work on some custom ones. For example, we probably made thirty to forty different Angry Birds balloons (see image below with the Bomb Bird balloon), which came out pretty cool. You can find directions and templates to use on The Party Animal’s blog (for kids parties). My best advice: know your limits! Just go with what you like and what you can get done in a reasonable amount of time. 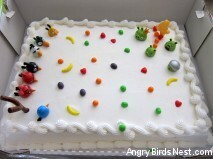 I’m sure you’ve seen many amazing Angry Birds cakes already. If you’re not a professional baker you might want to try and check out this Angry Birds cake tutorial with instructions on how make an Angry Birds cake from scratch. Even that is too much for me though. As much as we wanted to build a playable Angry Birds cake — or something equally awesome — we live in the real-world and we just didn’t have enough time. Instead, we kept it simple and ordered a plain white cake from Costco. 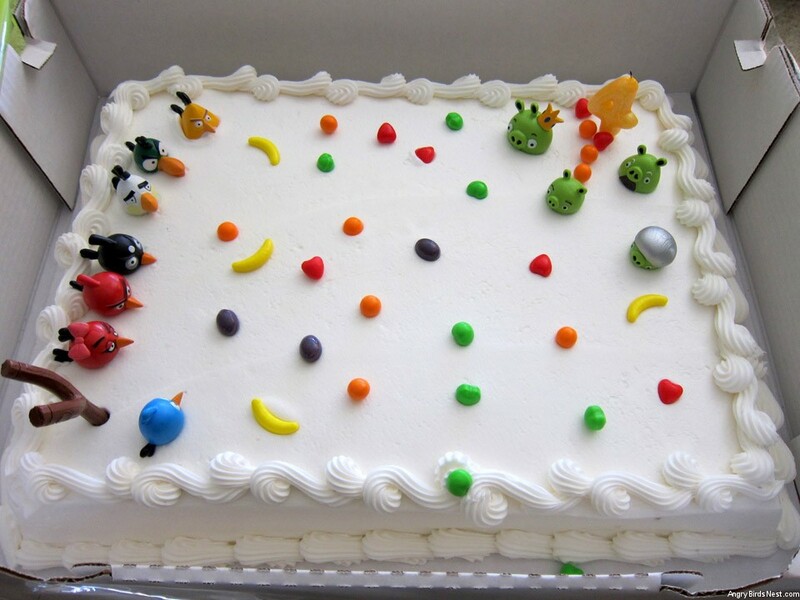 We then decorated it with runts and small Angry Birds figurines that we found online a month or so before. They were not edible, so we removed them before serving the cake. I know it’s not as amazing as some of the other cakes out there, but it was inexpensive, cute, and best of all, it tasted great. You could just as easily bake a simple cake and decorate it yourself. Below are a few other ideas. If you have your own we’d love to hear them too. Pour cold and frosty root beer into clear mugs with ice cream that has green or red food coloring mixed into it. Make sure you use the gel-type food coloring so that you don’t have to add much to the ice cream to get the bright color you want. Bake soms green, red, blue, yellow, and/or white cupcakes and smother them with sugary frosting and sprinkles. Pretty simple right? For our party we ordered 5 lbs of Runts (yes, they still make them) to use in party favors and have around as decorations. To be honest, 5 lbs was way too many, but that was the minimum order and they were not too expensive. Why Runts? They are colorful and they reminded us of the random fruit you’d find in the original Angry Birds. If you’re creating the invitations yourself they can be a little time consuming so plan ahead. That said, with a little creativity and a template or two you can probably whip up something amazing without spending a ton of money. Here is what we did for our invitations. At Target we bought some bright green and yellow poster board. Using the green we cut out simple pig bodies (basically an oval with ears). We used the yellow poster board for the nose and used a Sharpie to draw in the holes. Lastly, we glued everything together and stuck on some large googly eyes, which gave them a bit more personality. We hand wrote the information on the back and then mailed them in square envelops. Again, nothing spectacular, but they came out really nice and we were able to create them all in an evening. I’m not going to go into a lot of detail here, because you know what your partygoers will like best. For many the presentation is as important as what’s inside. As you can see we kept it really simple and used brown bags tied with white ribbon. To the ribbon with affixed some small Angry Birds cutouts that we had previously printed out on plain white paper. To seal them up just punch a hole in the top of the cutout and the bag and then tie them all together with the ribbon. I asked a sales rep at Toys ‘R Us if we could have the empty display box and they were happy enough to oblige. In the bags we included a soft golden egg stress ball, a silly straw, Runts, and a mini-slingshot to shoot the golden egg. You’ll need a helium tank, green balloons with pig faces drawn on (or not), some string, something to tape the string to, and something safe to throw at the balloons (the Birds). I built a simple PVC ladder to tape the balloons too and bean bags were stand-ins for the birds. Each balloon will have a set amount of points. The kids then toss take turns tossing the bean bags at the balloons. If they hit one of the targets, the tape will (hopefully) release and their balloon will float up into the sky and they’ll get X points. What to do with all those extra green balloons? Blow them up and let the little ones go “hog wild” stomping the piggies untill they all go pop! We found a cool a star piñata at Target. If you want to go the extra mile you can fill plastic Easter eggs with the candy then fill the piñata with the eggs! You can order gold eggs online or plan ahead and buy them during Easter. Just like an Easter egg hunt, but this hunt you can do any time of the year. Again, you can order golden eggs online or just use hardboiled eggs and paint them with gold paint that you can find at most local craft stores. There are even gold food paints, but I wouldn’t recommend eating a hardboiled egg after it’s been used for this game! Print out a bunch of these Angry Birds mazes created by @idrawmazes and have the kids race to see who finishes first. Thanks for taking the time to read this. 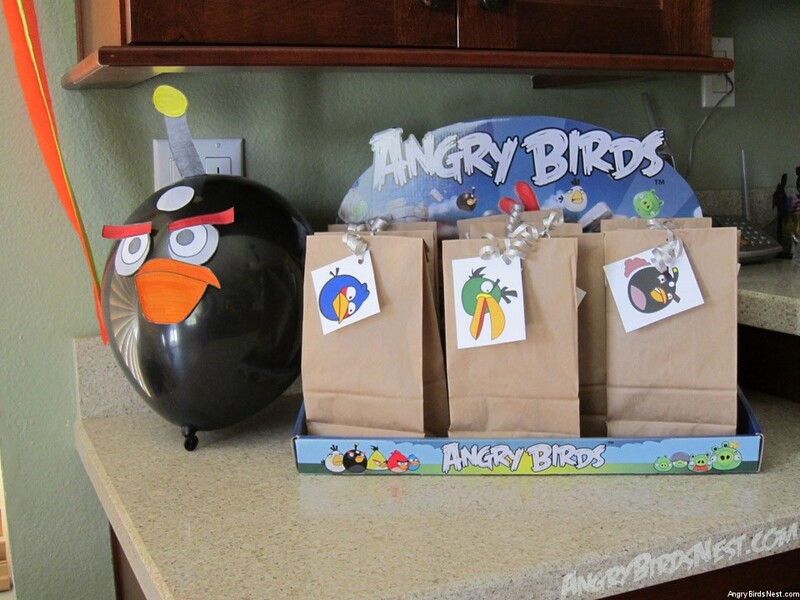 As you can see, throwing a great Angry Birds themed party doesn’t need to cost a lot of money and can be great fun. Just let your imagination go and you’ll be fine. As always, we would love your feedback and ideas, whether you used any of our ideas or not. Great ideas BL! Very creative! These are great ideas, too bad all of my children are too old for this theme! Very clever and creative. You can also download AB coloring pages- good for tucking in the goody bags. Thanks for sharing these. I wish there were mazes for all the birds. Get a Toss-Across bean bag tic-tac-toe game then cover the X’s with birds and the O’s with pigs. Put eggs on the third side of the triangles. Play several games with the kids randomly assigned to two teams. Give them a set amount of time or a set number of bean bag tosses to win the most eggs for the birds or the pigs. If the board goes all birds or all pigs, the round ends. Reshuffle the kids, reset the board and go at it again. The game is available for $30 or less or you might find one at a yard sale because it’s been around since the mid 1970’s. When the party’s over remove the birds, pigs and eggs and the kids can play with it as a normal Toss-Across. This was such a big help thank you so much!!! Thanks so much for the great ideas!!! We’re doing our AB party tomorrow, and tahnks to you I have several games to add! :D THANK YOU!!!!! Loved the balloons templates! They were awesome and the balloons were a big hit. I used the template for the Yellow Bird on our lemonade dispenser, too, and it looked really cool. We had fun constructing a rice krispie birdhouse for pig cupcakes and a launch podium for the bird cupcakes.